Hello! 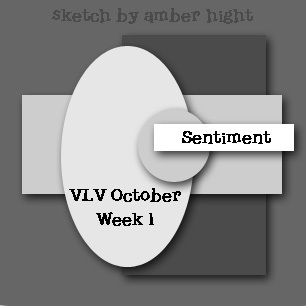 Today I had a chance to make a card for one of Amber's Viva La Verve challenges! Woohoo! It's been forever since I've been able to play along... This one is for the first October challenge -- details here. I had some happy mail this week.. new Verve stamps, so it was the perfect opportunity for me! I used the newly release Verve set, Bountiful Harvest. 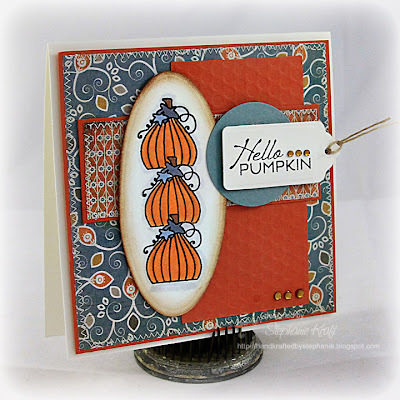 Julee has created some fun, whimsical pumpkins in this set and I just love them! There is a pumpkin trio as well as individuals of the pumpkins so you can paper piece, stamp them individually, etc. -- so many possibilities! I chose to use one of the pumpkin images and did a little masking so that I could stack them up. I colored them to go with Basic Grey Pyrus papers. I added some stitching and topaz rhinestones from Pizazz Aplenty. Accessories: Mega Ovals Nestabilities-LG, Tags 5 (Spellbinders), Polka Dot Basics II impression die (Papertrey Ink), Circle punch (EK Success), Rhinestones (Pizazz Aplenty), Twine (May Arts), Foam tape, Thread, Sewing machine. Wonderful fall card!! I love all the elements you put together-DP, dies and jewels, etc. Great job!! Beautiful! 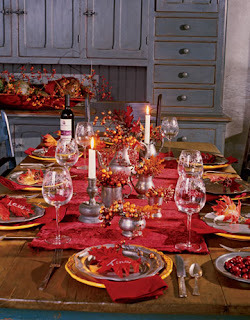 Love the orange and blue color combination.